Every now and again, I read a book related to the recovery field which helps create a small shift in the way I work. A few months ago, I read a book that has opened my eyes to a problem I knew existed… but had little idea about. A big shift in the way I work is occurring. 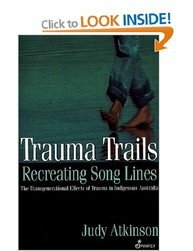 Transgenerational, or historical trauma, is the transmission of trauma across generations arising from colonisation and its associated violence and control, seen in Australian Aboriginals and other indigenous populations, e.g. North American Native Indians, Maoris of New Zealand. This historical trauma influences individuals, families and communities. Expressions of historical trauma in Aboriginal people can be seen in: adults who feel inadequate in their day-to-day functioning: the poor physical and psychological health and much lower life expectancy; the escalation in addiction to alcohol and other substances which are used as a coping mechanism; the increase in domestic violence across generations; the self-harm, suicide and risk-taking that occurs when people can find no meaning to their existence and have no sense of purpose for their day-to-day activities.